William Heinemann Limited first published The Colossus on 31 October 1960. The Colossus was first published by Faber and Faber Limited in 23 February 1967. It first appeared in Faber paperbacks in 1972, was reprinted in 1972, 1975, 1977 and 1980. It was reissued in 1987. Knopf published The Colossus & other poems on 14 May 1962. The table of contents differs significantly in the two publications. This was done to avoid complications and possible legal action because of some of the poems similarity to works by Theodore Roethke. The correspondence between Plath, Knopf, and Heinemann is held at the Harry Ransom Humanities Research center at the University of Texas, at Austin. Vintage Books, a division of Random House, began publishing paperback copies of The Colossus in 1968. The American edition excludes the following ten poems: Metaphors, Black Rook in Rainy Weather, Maudlin, Ouija,Two Sisters of Persephone, Who, Dark House, Maenad, The Beast, and Witch Burning. Knopf lost the bidding war for Ariel around 1965 to Harper & Row. Heinemann also failed to sign Ariel, losing out to Hughes' publisher Faber. Because she successfully published The Colossus with Knopf, Plath sent The Bell Jar to them for consideration. For a number of reasons, Knopf turned down The Bell Jar and the sensation that followed its 1971 publication likely upset the company. To see a bibliography of reviews of The Colossus, please click here. Faber published Ariel on 11 March 1965. Harper & Row published it in June 1966. Sylvia Plath ordered Ariel differently at the time of her death. Ted Hughes selected, edited, and published a collection that differed from Plath's intentions. For nearly 20 years, few people knew that Plath left a very different order and meaning to the collection she titled Ariel. As it stood, Ariel includes about a dozen poems Plath wrote in the last weeks of her life, poems that are of a very different inspiration and tone. Plath had arranged Ariel to begin with the word 'Love' in "Morning Song" and end on the word 'spring' in "Wintering". In the originally published Ariel, the book ends on the word 'life' in from the poem "Words". The two collections do read very differently, and I strongly suggest reading Ariel the way Sylvia Plath had ordered it. You can have arguments over whether publishers would have published her book, and Ted Hughes has claimed that he had to re-order it to get it published, but one will never know. The poems, read as a collection or individually, are phenomenal for everything from wit to cadence to subject. The reviews of Ariel were all quite positive. Readers likely felt stunned at the poetic development Plath exhibited from her first collection, The Colossus to her second. That Plath had died shortly after writing the poems was common knowledge; their immediacy was therefore all the more powerful. The British edition contained: Morning Song, The Couriers, Sheep in Fog, The Applicant, Lady Lazarus, Tulips, Cut, Elm, The Night Dances, Poppies in October, Berck-Plage, Ariel, Death & Co., Nick and the Candlestick, Gulliver, Getting There, Medusa, The Moon and the Yew Tree, A Birthday Present, Letter in November, The Rival, Daddy , You're, Fever 103°, The Bee Meeting, The Arrival of the Bee Box, Stings, Wintering, The Hanging Man, Little Fugue, Years, The Munich Mannequins, Totem, Paralytic, Balloons, Poppies in July, Kindness, Contusion, Edge, and Words. The American edition featured a similar table of contents, but with the addition of The Swarm, Mary's Song, Lesbos, and an introduction by the poet Robert Lowell. Please read Lynda K Bundtzen's The Other Ariel, published December 2001, for an insightful and thorough exploration of the genesis and scandal behind Ariel. Faber and HarperCollins published Ariel: The restored edition. This book prints the poems as Plath intended. Both versions of Ariel are still in print. To see a bibliography of reviews of Ariel, please click here. Crossing the Water appears differently on either side of the Atlantic. Of course, many of the contents are similar, but read one after another, these volumes read like different works. Faber published the book on 31 May 1971. Harper & Row published the book on 29 September 1971. The difference between these editions is in the arrangement of the poems. The American edition features many of the poems left out of the 1962 Knopf edition of The Colossus. While the British counterpart features a good many poems actually written in-between those written for The Colossus and those published in Ariel. The American edition ends on the poem "Crossing the Water" and the British edition ends with "Among the Narcissi". The reader is set up for a smoother transition between The Colossus and Ariel in the British version. Although both poems were written in the spring of 1962, according the Plath's Collected Poems, I feel that "Among the Narcissi" offers a better glimpse as to what Plath would produce. The title of the volume, Crossing the Water, connotes leaving one shore for another, or, going on a journey, the result of which is some significant change. In this regard, these poems do represent a literal crossing of Plath's poetic voice. As most were written between 1960 and 1961, this volume bridges the leap evident in the different styles, voices, and poems Plath published in The Colossus and Ariel. The contents of the Faber edition of Crossing the Water are: Wuthering Heights, Pheasant, Crossing the Water, Finisterre, Face Lift, Parliament Hill Fields, Insomniac, An Appearance, Blackberrying, I Am Vertical, The Babysitters, In Plaster, Leaving Early, Stillborn, Private Ground, Heavy Woman, Widow, Magi, Candles, Event, Love Letter, Small Hours, Sleep in the Mojave Desert, The Surgeon at 2 a.m., Two Campers in Cloud Country, Mirror, A Life, On Deck, Apprehensions, Zoo Keeper's Wife, Whitsun, The Tour, Last Words, and Among the Narcissi. Because these poems better represent Plath's transition than its American counterpart, the Faber edition of Crossing the Water is a much better collection of poems. To see a bibliography of reviews of Crossing the Water, please click here. Like Crossing the Water, the book Winter Trees, appears quite differently on either side of the Atlantic. Faber published Winter Trees on 27 September 1971; Harper & Row published it 51 weeks later, on 20 September 1972. I suspect these books appeared in 1971 to coincide with the American publication of The Bell Jar. The British edition book consists of poems left out of Ariel, either by Plath's original order or by Hughes's editing. The American edition features some poems left out of its version of Crossing the Water. Nonetheless, Plath wrote all the poems in 1962 or 1963. If one compares Plath's own ordered Ariel (see Ariel: The restored edition) with these volumes, one will see exactly what a volume of "late" poems should have looked like. The inclusion of Plath's verse play "Three Women: A poem for three voices" makes this book much fuller, and gives the reader an opportunity to see Plath's range of voices and styles. Plath took motherhood very seriously as Three Women, By Candlelight, Child, Childless Woman, and For a Fatherless Son illustrates. 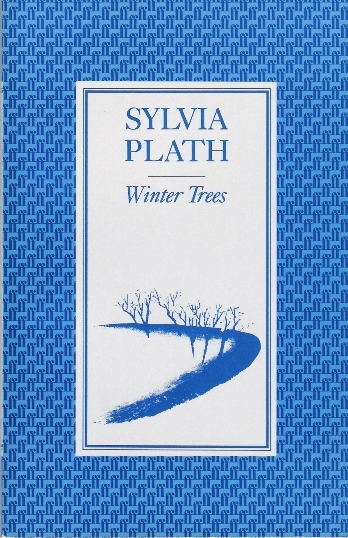 The Faber edition of Winter Trees contains the following poems: Winter Trees, Child, Brasilia, Gigilo, Childless Woman, Purdah, The Courage of Shutting-up, The Other, Stopped Dead, The Rabbit Catcher, Mystic, By Candlelight, Lyonnesse, Thalidomide, For a Fatherless Son, Lesbos, The Swarm, Mary's Song, and Three Women: A Poem for Three Voices. The Harper edition prints many of the poems not in the Harper Crossing the Water. This is an attempt to even out the book and bring the American audience more up to date with Plath's later poetry. As with Crossing the Water, the Faber edition, though slight at only 19 poems, is the better volume. 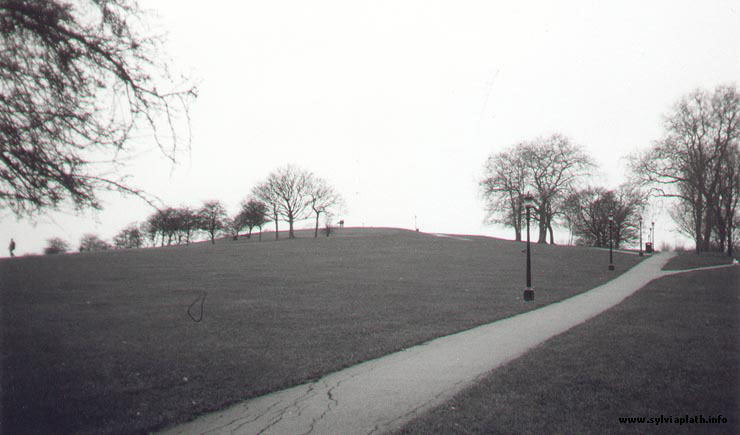 The Faber blue paperback which features a drawing of trees beside a walking path, is likely inspired by Primrose Hill. To see a bibliography of reviews of Winter Trees, please click here. Sylvia Plath's Collected Poems was the first collection of her poetry to feature the same table of contents both in the United Kingdom and the United States. Faber published the book on 28 September 1981. Harper & Row followed on 25 November 1981. Winner of the 1982 Pulitzer Prize for poetry, the collection was long overdue, coming a full decade after Crossing the Water and Winter Trees. The Collected Poems is an excellent, if incomplete, book. The collection starts with poems written in 1956 and continues through 1963. The book includes a random selection of 50 "juvenilia" poems and an incomplete list of other pre-1956 poems and notes, which, at times, can be very helpful. The Mortimer Rare Book Room at Smith College holds the working papers for the Collected Poems. These working papers include all known printed versions of the poems, as well as typescripts. It therefore holds copies of poems for which the typescripts are housed at other special collections. Also, it is possible to see and read more poems than were included in the final product. While it is easier to talk about individual poems and individual collections, a chronological reading of Plath's Collected Poems allows a reader to see a full, sequential growth of Plath as a poet. That being said, the poems not included in the Collected Poems hinders any attempt to see a "complete" Sylvia Plath. A "complete" edition of poems by Sylvia Plath would be a welcome addition to Plath scholarship. To see a bibliography of reviews of The Collected Poems, please click here. Forty-one years after her death, Faber and HarperCollins published Plath's original selection and order for her last assembled collection of poems, Ariel. The book includes a facsimile typescript of each poem, a Foreword by her daughter Frieda Hughes, and contextual notes and typographical differences by poet David Semanki. This book received, in my opinion, shockingly low publicity, especially considering the decades-old outcry from scholars and fans alike to "restore" Plath's intended collection after Hughes revealed the changed order in a note in Plath's Collected Poems. This publication is important for many reasons. It honors her intention for the collection, allows quite a different reading of these immediate, emotional poems, and provides wider access to Plath's archival material. By allowing readers access to see facsimiles of Plath's typescripts for the poems, the Estate shows examples of the holdings of the archives. Important aspects of Plath's output are the typescripts and other working papers. A deeper reading and understanding is possible from studying her deletions, inclusions, and additions. Ariel: The restored edition allows for a continued re-examination of Plath's work and life. While her reputation still rests largely on the power and urgency of the first Ariel, future studies and comparisons between the two volumes will enable a re-evaluation and enrichment of her public image. To see a bibliography of reviews of Ariel: The Restored Edition, please click here. On several occasions Sylvia Plath had her poems recorded. These readings may influence the way we eventually return to the poems; Plath's cadences, pauses, and pronunciations being something akin to a director's cues. The Poet Speaks 5. Argo, 1965. Record. Plath. Credo 3, 1975. Record. Sylvia Plath reading her poetry. Caedmon TC 1544, 1977. Record. Sylvia Plath reading her poetry. Caedmon CDL 51544, 1977. Cassette tape. The Poet's Voice. Harvard University Press, 1978. Casette tape. Sylvia Plath reads. Caedmon/Harper Audio, 1992. Cassette tape. Sylvia Plath reads. Caedmon/Harper Audio, 1999. Cassette tape. Sylvia Plath. The Voice of the Poet. Random House, 1999. Cassette tape. The Spoken Word: Sylva Plath. British Library, 2010. Compact Disc. Please see below for track listings for these publications. Like her printed poetry, many of the readings have been reproduced in compilation recordings. Many of these recordings are available at retail and internet stores, as well as at your local library (or through Interlibrary loan). For two wonderful essays on Plath's voice and recorded poetry, please read "Sylvia Plath's Voice, Annotated" and "The Oral Archive" both by Kate Moses in Anita Helle's The Unraveling Archive: Essays on Sylvia Plath. "The Oral Archive" is an annotated list of all known readings, interviews, and other recorded sessions. As Moses indicates, some recordings were not found. This leads one to conclude that other poems might be out there. For more information about Plath's relationship with the BBC and the poems she recorded (or had recorded), read "These Ghostly Archives" and "These Ghostly Archives, Redux", essays that I co-wrote with Gail Crowther. Includes interview with Lee Anderson. For The Living Poet, which broadcast on the BBC on 8 July 1961. Note: The poems read by Plath, only, were released in the British Library"sThe Spoken Word: Sylvia Plath (2010). Includes interview with Peter Orr. Plath. Credo 3, 1975. Inludes: The Rabbit Catcher, Ariel, Poppies in October, The Applicant, Lady Lazarus, A Secret, Cut, Stopped Dead, Nick and the Candlestick, Medusa, Purdah, A Birthday Present, Amnesiac, Daddy, Fever 103°, and an Interview with Peter Orr. Sylvia Plath Reading Her Poetry. Caedmon TC 1544, 1977. Includes: The Ghost's Leavetaking, November Graveyard, On the Plethora of Dryads, The Moon was a Fat Woman Once, Nocturne, Child's Park stones, The Earthenware Head, On the Difficulty of Conjuring Up a Dryad, Green Rock--Winthrop Bay, On the Decline of Oracles, The Goring, Ouija, The Beggars of Benidorm Market, Sculptor, The Disquieting Muses, Spinster, Parliament Hill Fields, The Stones, Leaving Early, Candles, Mushrooms, Berck-Plage, and The Surgeon at 2 a.m.
Sylvia Plath Reading Her Poetry. Caedmon CDL 51544, 1977. Includes: Same as Caedmon TC 1544, 1977. The Poet's Voice. Harvard University Press, 1978. Includes: Black Rook in Rainy Weather, Mussel Hunter at Rock Harbor, Maudlin, Sow, All the Dead Deers, Full Fathom Five, Watercolor of Grantchester Meadows, Snake-Charmer, Point Shirley, Departure, I Want, I Want, Lorelei, Moonrise, The Bull of Bendylaw, The Hermit at Outermost House, Frog Autumn. Sylvia Plath Reads. Caedmon/Harper Audio, 1992. Includes: Same as Caedmon TC 1544, 1977. Sylvia Plath Reads. Caedmon/Harper Audio, 1999. Includes: Same as Caedmon TC 1544, 1977. Excludes Leaving Early. Sylvia Plath. The Voice of the Poet (Series), Random House, 1999. Includes: November Graveyard, Black Rook in Rainy Weather, Sow, On the Difficulty of Conjuring Up a Dryad, On the Plethora of Dryads, All the Dead Dears, On the Decline of Oracles, Perseus: The Triumph of Wit Over Suffering, Battle-Scene, The Ghost's Leavetakings, Full Fathom Five, Lorelei, Point Shirley, Ariel, The Applicant, Lady Lazarus, Nick and the Candlestick, Purdah, A Birthday Present, Daddy, and Fever 103°. The Spoken Word: Sylvia Plath. British Library, 2010. Includes: Leaving Early, Candles, Two of a Kind (Interview, includes Mushrooms), The Living Poet (Includes: The Disquieting Muses, Spinster, Parliament Hill Fields, The Stones), Tulips, The Surgeon at 2 a.m., What Made You Stay? (Interview), Berck-Plage, Sylvia Plath reviews an anthology called Contemporary American Poetry edited by Donald Hall. With an introduction by Peter K. Steinberg.